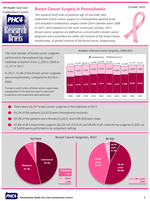 This brief examines the 11,717 breast cancer surgeries performed in Pennsylvania hospitals in 2017. Included are trends between 2008 and 2017, age and payer breakdowns, and surgery rates by county. Statewide in 2017, there were 20.8 breast cancer surgeries performed per 10,000 female residents.